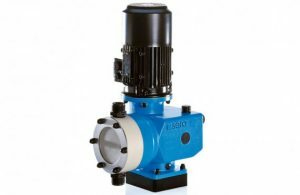 Air-operated diaphragm pumps are designed for a wide variety of products to be pumped: abrasive, corrosive, viscous, pure or loaded with solids etc. They are self-priming, can run dry, available in metal or plastic. These pumps are powered by compressed air. Through an "air divider" that drives alternately from left to right or vice versa a shaft on which two membranes are mounted. Their motion is alternating suction and pressure valves are also alternately moving and with a double pump effect. Air-operated diaphragm pumps are often used for explosive liquids, and other dangerous toxic products. ATEX certification is granted. They are extremely easy to maintain, rather simple in their structure and very light. Various accessories available depending on the requirements of the applications.